Earth education is traditionally confined to specific topics: ecoliteracy, outdoor education, environmental science. But in the coming century, on track to be the warmest in human history, every aspect of human life will be affected by our changing planet. Emerging diseases, food shortages, drought, and waterlogged cities are just some of the unprecedented challenges that today’s students will face. How do we prepare 9.5 billion people for life in the Anthropocene, to thrive in this uncharted and more chaotic future? Answers are being developed in universities, preschools, professional schools, and even prisons around the world. In the latest volume of State of the World, a diverse group of education experts share innovative approaches to teaching and learning in a new era. Topics include systems thinking for kids; the importance of play in early education; social emotional learning; comprehensive sexuality education; indigenous knowledge; sustainable business; medical training to treat the whole person; teaching law in the Anthropocene; and more. EarthEd addresses schooling at all levels of development, from preschool to professional. Its lessons can inform teachers, policy makers, school administrators, community leaders, parents, and students alike. And its vision will inspire anyone who wants to prepare students not only for the storms ahead but to become the next generation of sustainability leaders. "In our shared time on Earth, we must create a new Earth Education. We must help future generations learn the skills necessary to survive the rapid changes ahead—including moral leadership and conflict resolution—and engender a deep connection with other species, as well as our own. This book, and the Earth Education it defines and illuminates, points us toward that new path." Richard Louv, author of "Last Child in the Woods", "The Nature Principle", and "Vitamin N"
"Perilous times call for smart, hopeful, and vital education, grounded in deep understanding of how the world works and our place in it. 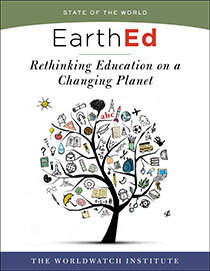 EarthEd is a reason to take heart, reminding us that we can learn from educators around the world who are drawing from traditional wisdom, new discoveries about learning, and innovative strategies to prepare and inspire students to become effective actors in our changing world." "The authors in this volume are among the leaders at the forefront of environmental education. The stories, research, and insight that follow will inspire by the examples, models, and sheer dedication and perseverance." Click here for an expanded table of contents. For complimentary videos to some of the chapters in EarthEd, click here. Today’s students will face the unprecedented challenges of a rapidly warming world, including emerging diseases, food shortages, drought, and waterlogged cities. How do we prepare 9.5 billion people for life in the Anthropocene, to thrive in this uncharted and more chaotic future? Answers are being developed in universities, preschools, professional schools, and even prisons around the world. In the latest volume of State of the World, a diverse group of education experts share innovative approaches to teaching and learning in a new era. EarthEd will inspire anyone who wants to prepare students not only for the storms ahead but to become the next generation of sustainability leaders. Check out this week's selection, chapter 16: Suddenly More Than Academic: Higher Education for a Post-Growth World.